Filmmaking is never easy. Even people who make sloppy work, have indeed done work. But, does the amount of work vary amongst genres? This seems like a no-brainer. Which type of film requires the least amount of labor? An argument could be made that documentaries fit the bill on this one. Once the filmmakers chooses the subject, they don't have to do any "writing", it all comes down to capturing real-life events or editing footage from things gone by. However, one can put too much work into a documentary and allow the art to get in the way of the story. 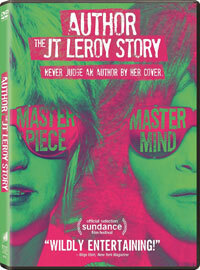 This is the case with Author: The JT Leroy Story, a great story which yields a bad movie. In the 1990s, Laura Albert was an overweight, depressed woman living in San Francisco. She would steal away from boyfriend Geoffrey Knoop and call suicide hotlines. However, she disguised her voice to sound like a teenaged boy, and invented a backstory which involved prostitution, abuse, and drugs. Dr. Terrence Owens, one of the experts with which she spoke, encouraged Laura to journal about her experiences. So, Laura began to write stories as this boy, whom she dubbed Jeremiah "Terminator" Leroy. She soon found her short stories being published and before long, a novel. Her book created a firestorm amongst fans and celebrities, but Laura knew that she couldn't appear in public, so she recruited Geoffrey's sister, Savannah, to play the role of JT, while Laura would take on the role of "Speedie", JT's handler. This duo took this show on the road, meeting famous authors and multiple rock stars. But, how long could they keep up this charade? What a crazy story! Sure pseudonyms have existed in literature since the beginning of time, but this is a pen-name which turned in a massive hoax which became a cultural phenomenon. While I like to think that I have my finger on the pulse of popular culture, I don't remember ever hearing about JT Leroy, so that added an extra layer of curiosity for the story. The fact that someone would not only attempt, but get away with such a charade is interesting, but that she also roped in people like Billy Corgan, Courtney Love, and Gus Van Sant makes this fascinating. On top of that, we've got the incredibly peculiar behavior of Laura which makes one wonder where she was coming from with all of this. So how did Jeff Feuerzeig mess this up so badly? The answer to that question is actually pretty simple and it's two-fold. First of all, he "Tarantinos" this thing way too much. I truly wish that I could go back in time and slap the first documentarian who decided that the best way to tell a story was to do it out of order. Author: The JT Leroy Story back and forth in time, and it's clear that the intent is to show how Laura's past influenced her behavior during this turbulent time in her life. But, things don't gel at times and the awkward stories from the past, while arguably important, take the focus away from the story of the hoax. The last two "flashbacks" are supposed to be twists, but they fall flat. They would have been much more powerful had they come earlier in the movie. Secondly, Feuerzeig does a good job of brining us the high-points of Laura's story, but he glosses over a lot of details, some of which hurt the film. First of all, there is no discussion of money. If the publisher didn't know that JT was a fake, how was Laura being made? How much was she being paid? (So many movies forget that "average" people who get a "regular" paycheck are often interested in how those in other walks of life make their money.) Feuerzeig either couldn't get or didn't attempt to get interviews with some of the key players in the story. Therefore, we are forced to rely on Laura's statements, while wondering how so many other players were feeling during this ruse. Finally, while Laura appears to be brutally honest, one can't help but wonder what else is going on with her. Based on her behavior and the stories from her past, there is presumably a mental health diagnosis there. The saga of Laura Albert and her creation of troubled writer JT Leroy is such a compelling one that Feuerzeig could have has a popsicle stick with googly eyes simply recite the story from beginning to end and he would have made a great movie. Instead, he decided to mix the past and present in such a way that we aren't allowed to truly be aghast at just how insane the whole thing is. There's no denying that there is a nearly unbelievable true tale of the American dream gone off the rails, but it's not worth sitting through this nearly 2-hour movie. Author: The JT Leroy Story reminds us the Bono can't mind his own business on DVD courtesy of Sony Pictures Home Entertainment. The film has been letterboxed at 1.78:1 and the transfer is enhanced for 16 x 9 TVs. Being a documentary, we get video from a variety of sources here. The modern-day interviews with Laura are very sharp and clear. Some of the archival footage shows video noise, or mild defects, but this is not related to the transfer. For the most part, the colors look good and the image is never overly dark or bright. The DVD carries a Dolby Digital 5.1 audio track which provides clear dialogue and sound effects. Again, being a documentary, understanding those being interviewed is the most important thing here, and in that sense, the track works well. For some of the areas where things are difficult to understand, such as the many conversations which Laura recorded, there are subtitles. The Author: The JT Leroy Story DVD contains no extra features.